My much ignored boxing card collection got an addition recently. 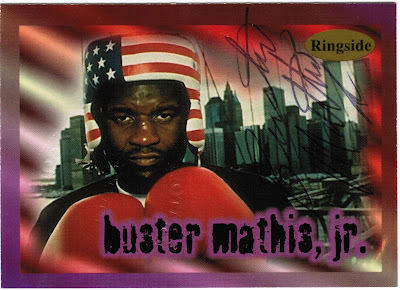 This looks like a In Person or TTM auto but actually this is a auto insert from 1996 Ringside. Ringside did it a little different than most other companies. Instead of a little blurb on the back about how you received an on card auto... they embossed the cards with a seal. It is hard to see in the scan but if you look at his boxing gloves (front scan) you can faintly see the embossment. 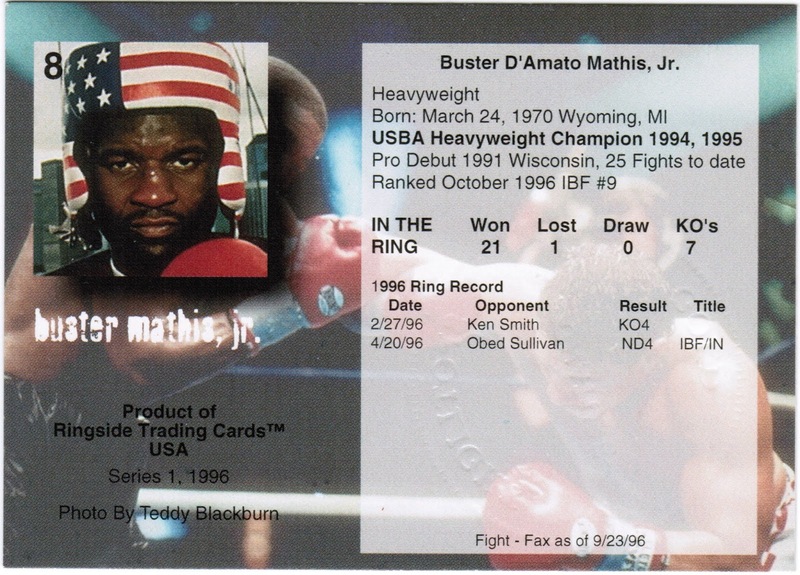 On the back you can faintly see it on the white box below his ring record. It says 'Spotlight Signature Gold in the embossment. This is my fourth Spotlight Signature card. I also have Carmon Basilio, Vinny Pazienza, and Willie Pep. I can't find a list of all of them all anywhere so I don't know how many more might be out there. The Basilio I actually pulled from a pack. The rest came via eBay. As an autograph guy... I can appreciate any 90's pack pulled signature. Tried searching for an autograph checklist on Beckett... but they only have the Pep on their checklist. I miss the days of signatures coming with the embossed seal! If memory serves, Skybox was the last to do that during the late 90's with Autographics.